In the hierarchy of criminals within the penitentiary system, murderers are feared, crime lords respected, and pedophiles despised. Where, one wonders, did the butter forgers rank? 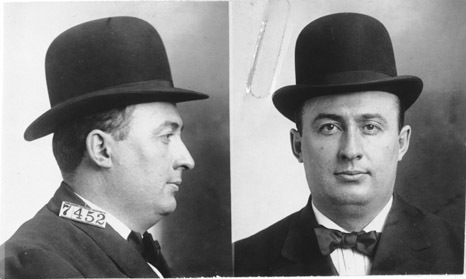 Alongside Machine Gun Kelly, and my namesake, the Birdman of Alcatraz, the Pen at Leavenworth housed violators of the Oleomargarine Act of 1886. Notorious, they were not. Take a look at Chuck Wille’s mug shot above. I wonder what bank robbers and car thieves thought of his dandy mustache. 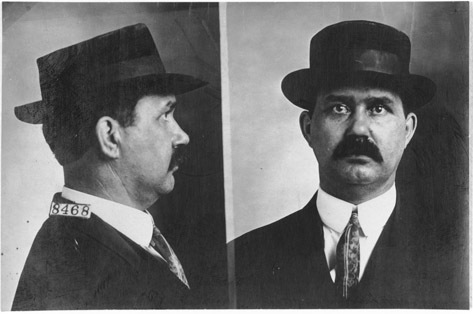 Joe Wirth, pictured to the right, looks more like a vaudeville comedian than a hardened criminal. I can easily imagine naive people being duped by someone who appeared as unthreatening as Wirth. John McMonigle, prisoner 8468, was not deterred by his stint in prison. He was sent to Leavenworth twice, due to an encore violation of the oleomargarine law. The word oleomargarine probably sounds alien to most young people. They know what margarine is—well, some of them do—but the oleo part likely sounds more like a cookie than a butter substitute. Oleomargarine was made from beef fat. A chemical compound of olein and margarine. Olein is “a colorless to yellowish, oily, water-insoluble liquid, C57 H104 O6.” How appetizing! Most people today opt for margarine made from refined vegetable oils, but even today animal “by-products” can find their way into margarine products. I recall growing up when oleo was still part of the American lexicon. My mother used it as a sort of synonym for margarine. That faded as I grew, but persisted long enough for me to vividly remember it. Washington State was one of those with a strong dairy industry. Such locations drew clear demarcations between butter and its “substitutes.” The dairy organizations vigorously challenged the “unnatural” competition. The primary battle line was whether or not oleo could colored to make it appear more like the food it was replacing. You see, in its natural state it doesn’t look nearly as tasty as when a yellow coloring was kneaded into it. Congress taxed the invention differently. Ten cents a pound for the yellow version, but only .25 cents (1/4 of a cent) per pound for the raw version. Amazingly, this tax did not end until 1951. Homemakers would color their own oleomargarine to get their unsuspecting children to eat the stuff. Nowadays, some people prefer margarine to butter. And, even when it was inferior to current standards, if butter was unavailable, most people would be delighted to have access to the alternative. Meanwhile, at the beginning of the twentieth century, 32 states—with strong dairy lobbies—banned the coloring of margarine by businesses. Naturally, where there is a law, there will be lawbreakers. Presumably private citizens were able to continue camouflaging the material in the secrecy of their own homes. The three criminals on this page violated the Oleomargarine Act. And they paid for their illicit marketeering. Regular readers of Mere Inkling may be wondering how in the world this subject connects with the Oxford don. Lewis wrote a wonderful essay, entitled “Religion: Reality or Substitute?” You can find it in the Christian Reflections collection, edited by Walter Hooper. The message of the essay is that we cannot completely trust our own experiences. Some people, he says, are inclined to think that the spiritual realm is a sort of “substitute” for reality, rather than real itself. Among the vibrant illustrations he provides for this is the following. ‘Substitutes’ suggest wartime feeding. Well, there too I have an example. During the last war, as at present, we had to eat margarine instead of butter. When I began doing so I couldn’t tell the difference between them. For the first week or so, I would have said, ‘You may call the margarine a substitute if you like, but it is actually just as good as the real thing.’ But by the end of the war I could never again have mistaken one for the other and I never wanted to see margarine again. This is different from the previous examples because here I started knowing which, in fact, was the substitute. But the point is that mere immediate taste did not at first confirm this bit of knowledge. It was only after long experience that the margarine revealed itself to my senses as the inferior. Lewis’ essay argues that “There is nothing we cannot be made to believe or disbelieve,” so it is necessary that we place our truth (faith) in something more reliable than our own impressions. Lewis is right. Just as there have been secular criminals who sought to profit off of the misrepresentation of oleomargarine, there are religious hypocrites and vermin who desire to deceive people about divine truths. The deepest purpose of all things dark, is to draw people away from the Light. Evil seeks to substitute the lie for the Truth. It has been this way ever since our first parents resided in the Garden. Whether one prefers butter or margarine, is left to individual taste, and of little consequence. However, whether we choose to consign ourselves to death, when freely offered Life, is something of eternal consequence.